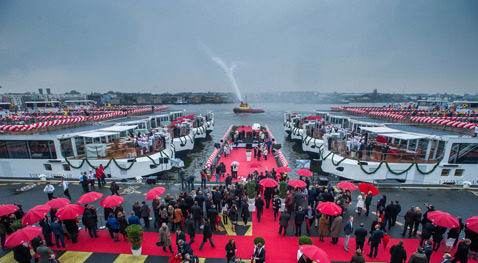 Los Angeles, 2015-3-28 — /Travel PR News/ — Marking another year of impressive growth, Viking River Cruises (www.vikingrivercruises.com) today welcomed the newest additions to its fleet of river cruise vessels at a simultaneous christening ceremony in Amsterdam and Rostock, Germany. The company christened a total of 12 new river vessels, including 10 of its award-winning Viking Longships® and two custom vessels for the Elbe River. This event officially brings Viking’s total river fleet size to 60 and comes just one year after the company set a GUINNESS WORLD RECORD™ for the most new ships launched in a single day. All 10 of the new Viking Longships will be deployed on Viking’s itineraries in Europe, including three of the most popular itineraries – Grand European Tour, Romantic Danube and Rhine Getaway. Also, as a result of high consumer demand for the Elegant Elbe itinerary, the two new specially designed ships will double the company’s capacity on the Elbe River for 2015. Since debuting in 2012, Viking Longships have amassed a long list of prestigious awards. They topped Condé Nast Traveler’s annual readers’ Cruise Poll for best river cruise ships – with Viking Odin specifically being named the #1 top-ranking river cruise ship – and the entire class of vessels was named “Best New River Ships” in Cruise Critic’s® Editors’ Picks Awards. Viking Longships integrate a patented corridor design and cutting-edge technology with comfortable amenities that reflect guest preferences and current travel trends. These features include a revolutionary all-weather indoor/outdoor Aquavit Terrace that reinvents the onboard lounge experience by bringing the panoramic outdoor river scenery indoors with retractable floor-to-ceiling glass doors and allows guests to enjoy the views and dine al fresco. Accommodating 190 passengers in 95 staterooms, Viking Longships have a patented layout that allows for two Explorer Suites – the largest river cruise suites in Europe – as well as seven two-room Veranda Suites with a full-size veranda in the living room and a French balcony in the bedroom; 39 Veranda Staterooms with full-size verandas; and 22 French Balcony Staterooms. Additionally, all Longships have sustainability upgrades, such as onboard solar panels and organic herb gardens, and energy-efficient hybrid engines that also reduce vibrations for a remarkably smooth ride. Hosting 98 guests in 49 staterooms, sister ships Viking Astrild and Viking Beyla will be the newest and most modern ships sailing the Elbe River. Smaller than Viking Longships, with customized hulls and engines specially designed to navigate this unique river, these ships tout many of the same popular features – including an Aquavit Terrace, a wide variety of stateroom choices, hotel-style beds, energy-efficient hybrid engines, onboard solar panels and an organic herb garden, as well as Viking’s signature Scandinavian design aesthetic. The expansion of Viking’s fleet comes as a response to increased traveler demand for destination-focused cruises, and there is still an opportunity to sail in 2015. Guests interested in current special savings discounts for 2015 departures and early pricing promotions for 2016 departures should visit the promotions page located on www.vikingrivercruises.com. In addition to the new Viking Longships and new vessels designed for the Elbe River, the company’s first ocean ship, the 930-passenger Viking Star, is currently under construction and will set sail with its first passengers on April 11, 2015. For more information, event images and b-roll, contact vikingpr@edelman.com. For booking details, contact a travel agent or call Viking toll-free at 1-855-8-VIKING (1-855-884-5464). Viking Cruises offers destination-centric river and ocean cruising designed for experienced travelers with an interest in geography, culture and history. Featuring onboard cultural enrichment and included shore excursions, Viking’s journeys are competitively priced for genuine value. Debuting its maiden season of ocean cruising in 2015, the sophisticated state-of-the-art Viking Star will host 930 guests on itineraries in Scandinavia and the Baltic; the Western and Eastern Mediterranean; and the British Isles. Two additional ocean ships, Viking Sea and Viking Sky, are also on order. As the world’s leading river cruise line, since its 1997 inception the company has grown to a fleet of 60 river vessels (in 2015) offering scenic cruising along the rivers of Europe, Russia, Egypt, China, and Southeast Asia. Viking has been honored multiple times in Travel + Leisure’s “World’s Best” Awards and Condé Nast Traveler’s “Gold List” as well as recognized by the editors of Cruise Critic as “Best River Cruise Line,” with the entire Viking Longships® fleet being named “Best New River Ships” in the website’s Editors’ Picks Awards. The travel trade has ranked Viking as the “Best River Cruise Line” by Travel Weekly, Recommendand Travel Agent magazines, “Best Cruise Line for Luxury River Cruises” at theLuxury Travel Advisor Awards of Excellence and as “Best Overall Cruise Line for River Cruising,” “Best New River Cruise Ship” and for the sixth consecutive year, “Best River Cruise Line for Travel Agent Support” in the 2014 TravelAge West’s WAVE Awards. For additional information, contact Viking Cruises at 1 855 8-VIKING (1 855 884 5464) or visit www.vikingcruises.com. To join the Viking Cruises community online, visit www.facebook.com/vikingcruises, www.facebook.com/vikingoceancruises and www.facebook.com/vikingrivercruises. This entry was posted in Cruises, Festivals and Events, Transportation, Travel, Travel Services, Travelers and tagged new river vessels, VIKING CRUISES, VIKING LONGSHIPS, Viking River Cruises. Bookmark the permalink.